A treat this magical will send them right over the rainbow! 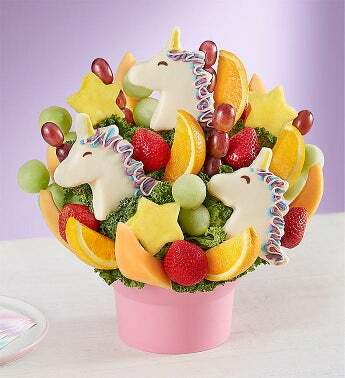 Our sweet, fairytale fruit bouquet features juicy unicorn-shaped pineapple slices, dipped and decorated with colorful manes and golden horns and arrives in an enchanted pink bowl. Fantastically delicious and perfect for sharing, it’s a gift beyond their wildest dreams.